A PYOP studio is ideal for parents with babies and toddlers who want to capture their little one’s handprint or footprint in a piece of pottery. Plus, it’s the perfect place for businesses that want to turn a holiday office party into something festive and fun for everyone. Personally-made gifts are not just items, but deeply meaningful gestures. Creating amazing gifts at a PYOP studio is fun, energizing, creative, and a delightful experience from beginning to end. The 2017 holiday season has arrived, and millions of people are already racing online and flocking to stores to find great gifts for family members, friends and colleagues. 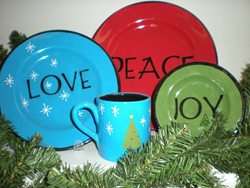 However, this year the Contemporary Ceramic Studios Association(CCSA) is inviting gift givers to experience the many rewards of personally creating gifts for the grateful recipients on their list by heading to a local Paint Your Own Pottery (PYOP) studio. 2. The experience of making something special and unique creates heartwarming memories that last a lifetime, whether gift givers head to a PYOP studio on their own, with family members, or with a group of friends or colleagues. 3. While it’s impossible to put a price on friendship and love, the fact remains that most gift givers need to stay in their budget. Creating gifts at a PYOP studio is affordable. 4. There is no risk that a present will be “re-gifted,” since the authentic sentimental value of something special and unique created at a PYOP studio never diminishes. On the contrary, it only increases over time. 5. Trying to find the gift for “someone who has everything” is frustrating — and often futile. Gifts created at a PYOP studio are 100% unique, and the perfect solution to this common challenge. In addition, a PYOP studio is the ideal destination this holiday season for parents with babies and toddlers who want to capture their little one’s handprint or footprint in a piece of pottery, or provide a grandparent or other relative with a precious keepsake. Plus, it’s the perfect place for businesses that want to turn a conventional and predictable holiday office party into something festive and fun for everyone. Facebook users can also follow the CCSA at https://www.facebook.com/ccsapaintyourownpottery, or connect with PYOP fans across the world at https://www.facebook.com/Paint-Your-Own-Pottery-206166622756971/. The Contemporary Ceramic Studios Association (CCSA) is a not-for-profit trade association serving the needs of ceramic and paint your own pottery studios and suppliers around the world. The Mission of the CCSA is to promote creativity and excitement about our industry and be a resource for our members. Whether you're a seasoned studio owner or someone who is thinking about opening your own Paint Your Own Pottery studio, this is the place to be. Learn more at http://www.ccsaonline.com.